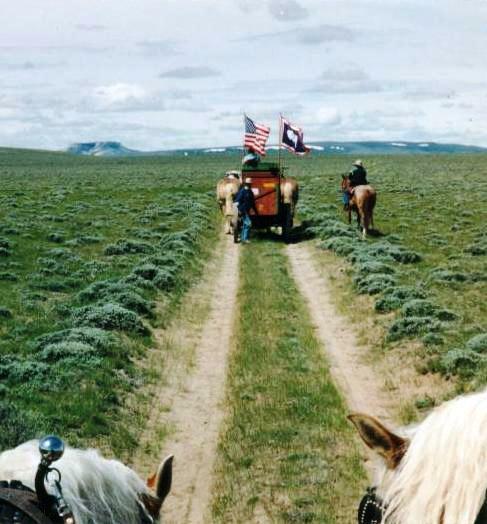 Commemorating travelers on the Oregon Trail through Fremont County. The earliest inhabitants of Fremont County (population 38,000) left petroglyphs, tepee rings, and medicine wheels in numerous locations. By 1829, fur trappers, traders, and Indians were rendezvousing in the area. The Oregon-California-Mormon Trail crossed over South Pass, where gold was later discovered. Camp Augur, a military post established in 1869, became the town of Lander in 1874, which was designated the county seat when Fremont County was created 10 years later. The county is home to the Wind River Indian Reservation, which was established by treaty with the Eastern Shoshone Tribe in 1868. In 1877, the Northern Arapahos joined the Shoshones on the reservation. Today the two tribes continue to share the land, which is the seventh largest Indian reservation in the United States, by area. The Wind River Reservation commemorates the signing of the treaty creating the reservation in the annual "Treaty Days" at Fort Washakie. The fort was named in honor of the last chief of the Eastern Shoshone Tribe, and is the only fort in the country named after an Indian chief. Fremont County has a long history with the natural resource industry. Early coal mines were dug near the town of Hudson, and later oil and gas became important industries, as well as uranium and iron ore. The farming and ranching industries were also very significant in the early development of the county and continue to be a major influence today. As early as 1886, local residents formed the Fremont County Pioneer Association in order to preserve the history of early settlers in the Lander Valley. This group raised funds for a one-room cabin as well as for the Pioneer Museum, built in 1915. The first museum building erected in Wyoming, the museum and its collections became county property in 1964. In 1998, the buildings had deteriorated to the point that they were declared hazards by engineers, and were consequently closed to the public. Volunteers donated time and money to find a new home for the museum, creating a complementary organization and new museum, the Museum of the American West, in the process. The Fremont County Pioneer Museum re-opened its doors in 2009 in a state-of-the-art building, and in less than a year had more than 8,000 visitors. The community supports all of the museums in the county with volunteers, and the Lander Valley School District has extra-curricular history classes for students to learn about local history and train to become museum guides during the summer.